Need a small-enough bag for bringing a small towel, a shirt, or other smaller-sized items? The Zumub Small Bag is the perfect one for you! The Zumub Small Bag is smaller than your typical gym bag, making it an ideal bag for carrying just a few items for your day-to-day activities, such as an extra shirt, a towel, or some snacks. This bag may be small in size, but it is big in quality and dependability! 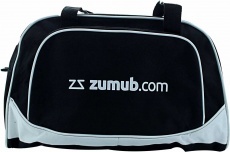 The Zumub Small Bag is available in black with white trimmings, and of course, it shows the Zumub logo in front so you can let everyone around you know where to get the best supplements at the best prices! Have a question about Small Bag? What is it, what does it do, how and when to use or something else? Ask us. Small Bag is a discontinued product. Please browse other products you might be interested in..